I’m ready for a new year. This closing year of 2015 has been one of the hardest in my life. Probably the hardest to date. There is a part of me that wants to throw it away. Forget about this past year and move on to a new and hopefully better year. But is that really the case? Do I really want to forget about my two baby boys born and lost? Do I want to forget about the passing of my grandma as well? Do I want to forget those precious babies my dear friends have also lost? Do I want to leave behind all the pain? That I do, but I don’t want to forget the lives that are missing. I do want to treasure their memories. If I try to bury and forget the year then I will forget them too. But there is something even greater. When I was at my darkest hour, when I thought the world should just end and when I wanted the pain to just leave me, God was there. He is here now. He says He will never leave me or forsake me and now I have tasted that and know it to be true. In my loneliest times he was still there with me. That I treasure more than anything. To know my God is bigger. He is with me and light dawns in a new day. Darkness flees. I saw that in a new way this year. I am looking forward to a new year and I do have hopes for new joy in the morning, but life doesn’t have to have happiness in order for joy to come in the morning or in the mourning. Joy is in Christ alone. He has solved my biggest problem of imperfection before a holy God. My hopelessness now has hope. My sadness is for a moment because I do not have eternal despair. 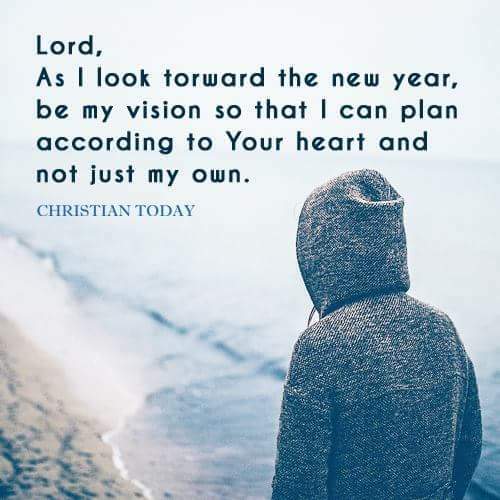 A friend sent this to me from Christian Today International and it is my prayer for the new year!